Dr. Taff–I have just been re-reading Sanderson’s “Invisible Residents”. He was a pioneering anomalist (and cryptozoologist) and many of his conclusions are still, I believe, valid. Your extrapolations of UFO and USO activity seems cogent to me. I am not in the “aliens are behind it” camp; I have seen no convincing proof. I think we need to consider two earthly sources: our ancestors from before the Cataclysm, and surviving Nazi technology. The former is indicated by Vedic scriptures; the latter is strongly indicated by Dr. Farrell, Stevenson, and others. Scalar engineering and control of torsion fields are highly probable, given the nature of UFO/USO operational characteristics. Keep up the good work. Daniel. Thanks for your compliment and writing me on this issue, very much appreciated. To start with, read my blog on this site entitled “Building A Warp Drive Engine”. I’m very familiar with the research and writing of Ferrel, Stevenson, Beardon and others, but I think that they only touched the surface here. 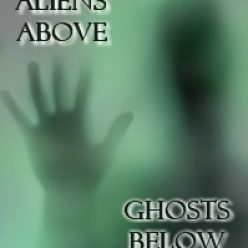 In fact, I discuss much of this in my book “Aliens Above, Ghosts Below: Explorations of the Unknown”. Are you aware of my book? Some UFOS are certainly our own, but others are not. According to the ex-head of Lockheed Martin’s Skunk works, Ben Rich, made some very comments regarding all of this before he passed away in the mid-1990’s. Some of these are discussed in my warp drive blog.